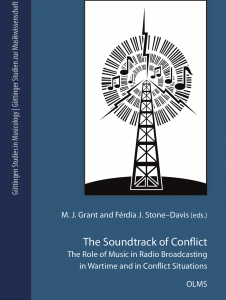 The Soundtrack of Conflict: The Role of Music in Radio Broadcasting in Wartime and in Conflict Situations (Olms, 2013). Since the early twentieth century, radio has been one of the most important media both generally and in the specific context of armed conflict. Relatively cheap and with the ability to transmit over long ranges – and over international borders – radio has become central to the wartime strategies of governments and guerrilla groups alike. The role of music on radio in wartime and in conflict situations has, however, only rarely been the focus of scholarly attention, despite the central role that music plays in this medium. The essays in this co-edited volume offer case studies that explore the many important roles that music broadcast on radio can play in wartime and in conflict situations – as a means of information (and misinformation), as a communication medium by those separated by and yet connected through the fighting, and as an aid to managing the complex emotions that are experienced. Moreover, the essays demonstrate that music is not just a soundtrack to conflict, but can also influence the very course that a conflict takes. In the range of examples discussed and the theoretical issues raised, the volume presents a significant contribution to the musicological study of war and conflict.